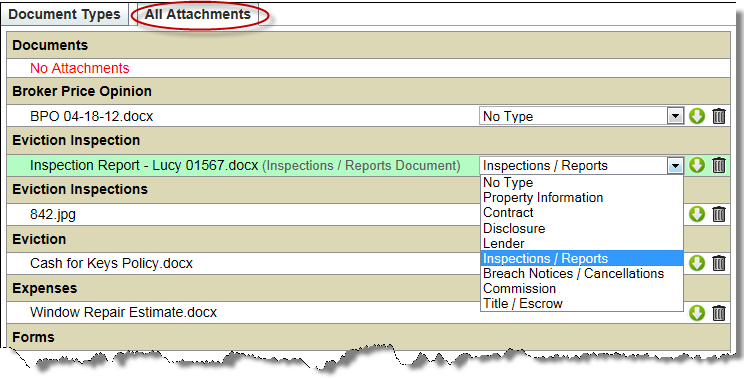 Because documents can be added to a property through note attachments and from various other locations within Broker Brain, the All Attachments sub tab found on the Documents tab provides an invaluable resource for accessing all of a property's documents in one place. This tab, however, sorts the documents by the location on which they were added. Thus we added document types. Document Types allow you to group similar documents based on their type, which you can then view on the Document Types sub tab. This makes it even easier to locate documents, particularly if you have a large quantity of them. An example of the Document Types sub tab can be seen in the screen shot below. Broker Brain has several default document types that will appear on this tab; however, you can create additional types from Admin>Types. Click here for more information on how to do that. See below for instructions on how to add a type to a document or change an existing document type. This can be done directly from the Documents tab. 1. 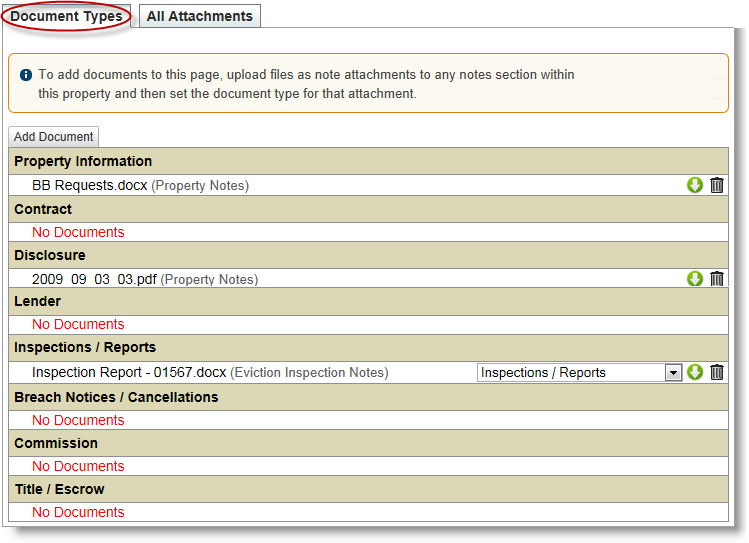 From the Documents tab, click on the All Attachments sub tab. 2. As shown below, each attached document will show the document type currently specified. If there is no document type, the words No Type will appear. To change the type, click the drop -down arrow adjacent to the current type. A list of available types wil appear. 3. Select the desired type. The type will automatically update in Broker Brain. You can also change document types from the Document Types sub tab, but only for documents that were previously assigned a type.